Fons Trompenaars studied Economics at the Free University of Amsterdam and later earned a Ph.D. from Wharton School, University of Pennsylvania, with a dissertation on differences in conceptions of organizational structure in various cultures. He experienced cultural differences firsthand at home, where he grew up speaking both French and Dutch, and then later at work, with the Royal Dutch Shell Group in nine countries. Fons entered the Royal Dutch Shell Group in 1981 and moved into the Personnel Division for Shell in Rotterdam. From 1985, he worked in job classification and management development at the Shell Research Laboratories in Amsterdam. In 1989 he became Managing Director of the Centre for International Business Studies (C.I.B.S. B.V.), a consulting and training organisation for international management; which now trades as Trompenaars Hampden-Turner. 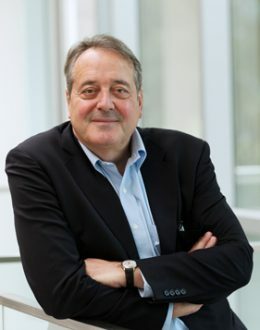 He has worked as a consultant for such companies as: Shell, BP, Philips, IBM, Heineken, Applied Materials, AMD, VNU, TRW, Mars, Motorola, General Motors, Dow Chemical, CSM, Telfort, Wolters Kluwer, Gerling NCM, Merrill Lynch, Johnson & Johnson, PepsiCo, and Honeywell. Fons Trompenaars wrote Riding the Waves of Culture, Understanding Cultural Diversity in Business, (1993). This book has sold over 120,000 copies and has been translated into French, German, Dutch, Korean, Danish, Turkish, Chinese, Hungarian, Polish and Portuguese. He is also co-author of Seven Cultures of Capitalism (1993), Building Cross-Cultural Competence (2000) and 21 Leaders for the 21st Century (2001) with Charles Hampden-Turner. He published Riding the Whirlwind, a dynamic new take on creativity and innovation. Fons has co-written an article with Peter Woolliams entitled “Lost in Translation” regarding culture and failure, which was published in the April 2011.